Anyone who finds the world of corporate finance a bit dry should spend some time reading Apple’s financial reports from the past year. In an era of economic uncertainty, with consumers keeping a tight grip on their pocketbooks, Apple and its lineup of computers, phones, and other electronic gadgets just wrapped up another banner year. Before the calendar flips to a new year, it’s worth going back to look at Apple’s financial highlights from 2011 and contemplating whether recently appointed CEO Tim Cook can keep the momentum going into 2012. Apple’s fiscal year begins in October, meaning the company actually has a three-month head start on 2012. More to the point, it also means the company’s fiscal first quarter includes the holiday shopping season—an especially important period for Apple and its lineup of consumer-facing products. We’ll have to wait until the middle of next month before we find out how Apple fared in the most recent holiday season, but if it’s anything like last year, Apple will get its 2012 fiscal year off to a strong start. For the first quarter of 2011, Apple reported sales of $26.74 billion and a net profit of $6 billion—both quarterly records at the time that the company later eclipsed by the end of its 2011 fiscal year. Much of that holiday merriment was fueled by sales of iOS devices. During last year’s holiday season, for example, Apple sold 7.33 million iPads—nearly matching the total number of tablets sold during its entire 2010 fiscal year. A thriving Mac business is likely helping to bolster that confidence. 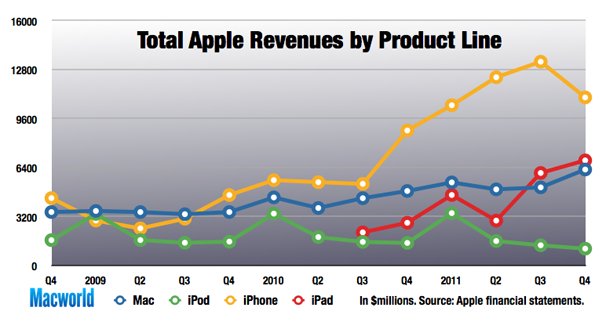 In both the first and fourth quarters of 2011, Apple sold a record number of Macs. The two quarters it didn’t set a new all-time Mac sales mark represented records for those specific quarters. Mac sales are growing steadily at a time when other PC makers are struggling to maintain single-digit sales growth. Take Apple’s fourth quarter, when the company set a record for quarterly Mac sales by selling 4.89 million machines. The 26-percent jump in sales from the year-ago quarter was six times the growth rate forecasted for the overall PC market by research firm IDC. Throughout 2011, in fact, Apple’s Mac growth consistently outperformed the overall PC market. The reason can probably be summed up in one word: Portables. Apple continues to make changes to its laptop lineup—it introduced Thunderbolt to both the MacBook Pro and MacBook Air this past year—that appeal to consumers. Portables account for more than 70 percent of Apple’s Mac sales; in the fourth quarter, nearly three out of every four Macs Apple sold was a portable. Apple’s iOS business is even breathing some new life into the one product line that’s beginning to show its age. iPod sales growth continued to decline in 2011—it’s been nearly three years since quarterly iPod sales have increased from the year-ago quarter. Yet, the iOS-powered iPod touch now accounts for roughly half of the music players that Apple sells. Not only has that helped Apple maintain its dominant share of the MP3 player market, the comparatively high price tag of the iPod touch—prices started at $229 for an 8GB model during the past fiscal year, before dropping to $199 in October—has kept the average sales price of an iPod relatively stable even as overall sales have flagged. Apple ramped up its retail efforts in the past year, both on the digital and brick-and-mortar fronts. For the former, it opened up a new online software emporium aimed at Mac users while the latter saw more Apple Stores opening up outside of the U.S. The Mac App Store was easily Apple’s most noteworthy retail effort in 2011. Opening its virtual doors last January, the Mac App Store represented Apple’s attempt to do for Mac software what its iOS App Store had done for programs that run on the iPhone, iPad, and iPod touch. It began with a little more than 1000 apps, but has grown to several thousand. More important, within 11 months, the Mac App Store passed the 100 million download mark. That’s a figure that doesn’t include re-downloads, software updates, or Mac OS X Lion downloads, by the way. A controversy with the Mac App Store is looming in the form of Apple’s March 2012 requirement that Mac App Store offerings must implement sandboxing, which could require some app makers to remove features from their software. If developers balk at sandboxing, it could stall the Mac App Store’s momentum. Still, Apple’s latest online outlet for apps is off to a strong start. Apple’s first retail store in Hong Kong opened in September, highlighting the company’s efforts to expand its retail presence in other countries. As for its brick-and-mortar stores, Apple ended its 2011 fiscal year with 357 retail outlets around the globe. Apple stepped up its retail efforts outside the U.S.: Of the 40 new stores opened during the past year, 28 were in other countries. Apple was particularly active in China, where it opened stores in Hong Kong and Shanghai. 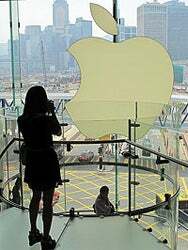 In fact, Apple’s six Chinese stores are among its highest trafficked, company executives have said. Apple enters 2012 with a number of potential stumbling blocks on the horizon. Though its iOS devices have thrived so far, a number of rival products hope to eat into the market share enjoyed by the iPhone and iPad. Flooding in Thailand is threatening the supply of hard drives, which could put a strain on all PC makers, including Apple. We’ll find out how Apple is dealing with these particular challenges when it releases its first-quarter numbers in about three weeks. Apple also has a lot of cash at its disposal. The company ended 2011 with $81.6 billion in cash and short-term investments, and Cook has indicated that Apple isn’t “religious about holding cash or not holding.” Some have taken that as a sign Apple could pay out a dividend to its shareholders, something it hasn’t done in nearly two decades. A more likely scenario, though, is that Apple uses some of its cash to snap up companies with technologies and products that augment what’s already coming out of Cupertino. To that end, Apple has reportedly paid out $500 million to buy Anobit Technologies, a maker of solid-state drives who could give Apple a boost in the mobile market. (Neither company has confirmed the sale.) If that deal does seem particularly noteworthy, keep in mind that Apple’s 2010 purchase of a developer called Siri didn’t exactly set the world on fire—until the technology Apple got in the deal was used to create an iPhone feature that nearly everyone’s talking about.